Yes, it’s still those of us here at the headquarters of the organization formerly known as Backup Ribbon Project. As you can see by the rather large new banner header, we are finally getting around to that rebranding as Geeks Got Your Back. If you typed in the old URL — backupribbonproject.com — you *should* (please, please, Great Internet Ghods) be redirected here to the new URL. We are currently OUT OF RIBBONS and are in the process of sourcing the price for a new setup with the new URL. And because, of course these things all happen at the same time, we also will be setting up our fundraising site again with a new host. However, you can still donate directly by clicking on the Paypal button on the right sidebar. 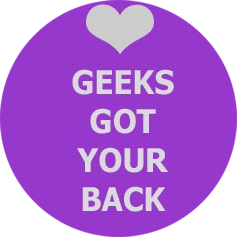 As ever, we are grateful for your patience as we stagger forward into the next phase of this Rube Goldberg machine now known as Geeks Got Your Back! Yeppers; it works for me. Checkin #1, achieved.